SB Surfacing don't just install resin bound aggregates. We also lay artificial grass for domestic and commercial clients. Working closely with our parent company Silver Birch Landscapes we have successfully installed artificial lawns for an increasing number of clients. 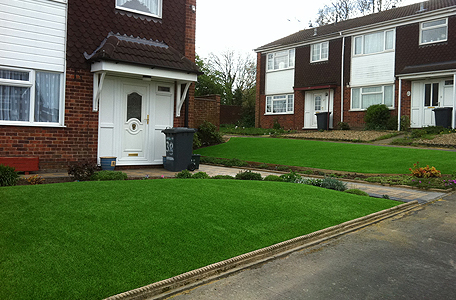 Like the resin bound surfacing, artificial grass is affordable, durable and virtually maintenance free. Advances in artificial grass technology and grades have come a long way in the last 20 years, with the quality grasses we use looking like the real thing. Artificial grass is also ideal for allergy sufferers. There is obviously no need for mowing after installation of your artificial lawn and this helps keep the area much cleaner from irritants allowing the sufferer to continue to enjoy the garden, be it playing sports or socialising with friends and family.